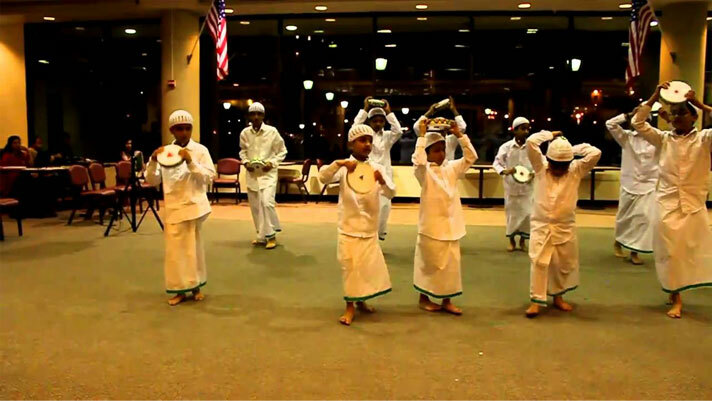 Duffmuttu is an art form which is seen among the Muslim communities in Kerala. Duff is a musical instrument which is made of wood and animal skin such as Ox or goat. It is also called as Dubh or Thappitta. The dancers carry this and play with it while dancing. The artists stand in a U shape or semi circular form and then sing a traditional Arabic song according to which they dance. This was what was prevalent during the olden times but now the performers sing any Islamic song and then dance accordingly. It is also performed in the Gulf countries in different manner and in the Madina in Saudi Arabia. It was believed to be originated in Madina. The songs sung during the play are based on themes such as tribute to martyrs and other heroes. Duffmuttu is also known by the name Aravanamuttu and is performed as a social event during any festivals or auspicious ceremonies. To celebrate any festivals in the mosques, duffmuttu is performed. The Duffmuttu is performed from the paddy fields to praise the Lord. If the Duff is not available then Arabana is used instead. It is the leader of the group who sings the song and the other artists play the duff. The dance is performed at any time and hence there is no special time for the play. At present the duffmuttu is conducted as a stage show also.